swimming, snorkeling, boogie boarding and surfing. best at what they do. to check emails and print boarding passes. hope to be able to meet you in the near future. Here are just a few of our past guest's comments. TripAdvisor, Frommers and Fodors websites. “I love your place and sing your praises constantly! Iron and ironing board, hair dryers, beach towels, beach chairs and cooler, books and games. Snorkel gear and boogie boards for rent. Can be waiting on your lanai upon arrival. Helicopter adventures, Zip lining, ATVs, wind surfing, surfing, stand up paddle boarding, water skiing, luaus, Na Pali boat trips, sunset sails, off road 4x4 adventures, yoga classes and movie tours. Single story two bedroom, two bath cottage at Hideaway Cove. All villas have top of the line beds with pillow top mattresses. Want to read a good book. 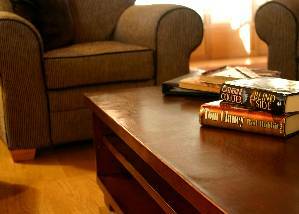 Each Villa has a library with all your favorites. In additional to a half acre of tropical landscaping, there is lots of open areas with wide expanses of lawn. All Villas feature granite counters, ceramic top stoves, microwaves, toaster ovens, dishwashers, fridges with ice makers and more! All villas feature both indoor dining shown here as well as outdoor dining on a covered lanai with individual stainless steel bar-b-cue. All sliders have custom lined drapes. Living rooms feature leather and overstuffed couches and chairs. Private, quiet, and close to the beach. Clean, comfortable home away from home. We stayed in the 'Dolphin' studio and we couldn't possibly have been more comfortable. The studio was very large and was equipped with all the necessary amenities which were far more then we found necessary. I've stayed at the Hyatt and I still found the Hideaway more comfortable. There is no charge to use the washer and dryer which came in handy after a day of swimming and wearing the same shirt for a few days.. The place even had an iron and board. I am a 'clean freak' and always bring my own cleaning spray and it took only five minutes to do my extra sanitizing because the studio was already in such a clean state. When we return to the island we most definitely plan to again stay at the Hideaway. I hope everyone reading this will not start booking on my time schedule consequently causing me to look for another place..
We are having a great time in Kauai and love the Hideaway Cove. It is truly an island paradise! We had privacy and quiet in this restful place. WE LOVED IT!!! The place was immaculate, the design was beautiful and with the close proximity to Poipu Beach, we were simply overwhelmed! We stayed at a resort in Maui, which was nice, but being able to put the baby in another bedroom was just what we needed to get a little more R & R.
Above all, we were so excited that our six month old son was able to swim in the calm waters at Poipu Beach. . .his first time actually swimming in the ocean. Absolutely priceless. Food recommendations: The Beach House, Koloa Mixed Plate, Bubba's Burgers! Perfect, same as last year! 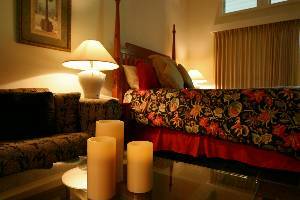 This was our 2nd trip to Kauia and, once again, we stayed in the Royal Palm suite. It is located at the back of the property and has its own walkway. Very private; you see no one and it is very quiet. There is air conditioning throughout and it works great. The bed and linens are very comfortable. The condo is very clean and contains everything you need. The property is located up the road from Brenneche’s –the best beach for boogie boarding. But be careful—my husband body surfs here in MA every summer and he really got knocked around. Poipu beach is just a couple of minutes further down the road. Lots of turtles and tropical fish. We saw a monk seal twice this time! We wouldn’t stay anywhere else. Promise you won’t try to rent it when we want it! We stayed here for a week in September 2008. Weather was wonderful, lots of sunshine. Room was clean, spacious and had everything we needed. Diane who works there was so helpful and made sure we had everything we needed. There was a bottle of champagne waiting for us when we arrived (we were there on our honeymoon) and snorkel masks and flippers waiting for us. Really excellent place to stay, make sure you go to Brenneckes for dinner one night, and watch the sunset every night...paradise is an understatement. If only we didn't live so far away...we'd be there every week! After deliberating a few weeks I've decided to take a chance and write a review of Herb and Gail's upscale accommodations hoping there will still be availability the next time we want to relax and unwind in a tropical paradise. My wife and I had a great time enjoying both units in which we stayed. The interior and landscaping were first class and give a real Hawaiian island experience. The plantation style hotel's location, just a short walk from Poipu's excellent beaches and restaurants, and its quiet, comfortable, lanais made our fifth visit to Kauai the best ever. If you want to relax and soak up sun and scenery, Kauai is the island for you. If you want discos, noise, and the hum of a large city, this isn't the place for you. Dear Herb, Hideaway Cove was simply the best part of our vacation to Oahu and Kauai. Hawaii is like a 2nd home to My wife & I because we both lived parts of our lives there and it's where we met. My Grandparents lived right down the road for 25 years and now that they're gone, it's nice to have a new place to stay there in Koloa. Two blocks from the ocean and Poipu Beach Park, beautiful gardens, wonderful room, friendly staff. We'd return here anytime. We had 10 of us at Hideaway Cove: three couples and four children. The upstairs/downstairs units at the big house are superbly furnished, fabulously located, and the right price. The beach (best on the island for young kids) is a 5 minute walk. Diane and the rest of the staff are fantastic in helping to make the experience relaxing, fun, and efficient. My husband and I stayed at Hideaway Cove for the first 3 days of our week long trip in Kauai. The staff there was unbelievably helpful with the planning of our stay and our activities. They helped book us on a zipline adventure and had great suggestions of places to go for fun and food. The one bedroom villa had everything we needed! The refrigerator had delicious fruit juice waiting for us upon arrival. Although we didn't cook during our stay, there was a BBQ grill on the porch and the kitchen had everything you needed to prepare your own meals. Hideaway Cove provided beach chairs, towels, and a cooler which we appreciated for the beach. The Po'ipu beach is walking distance. This was our second time to Kauai and we love staying in the Po'ipu area. All in all, our time at Hideaway Cove exceeded our expectations and we would recommend it to anyone traveling to Kauai. 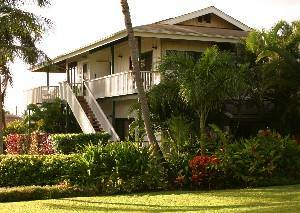 Tucked away in a residential area just one block from Poipu Beach is Hideaway Cove Villas, our home for seven virtually perfect days and nights on our first visit to Kauai. We arrived late at night and found our keys waiting for us along with a letter containing all the information we would need for our stay, and in the refrigerator was exactly what I needed most at that moment--a pitcher full of delicious, cold fruit drink. The next day we went to Koloa just a short drive away and bought groceries for a week. We sampled the local restaurants but also were able to cook our own meals in our villa, which was a big advantage at times after a long day of sightseeing. 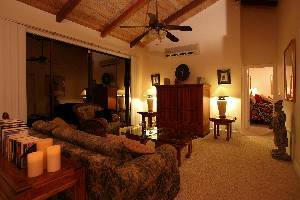 The villa was clean, modern, well equipped and tastefully furnished and was in a perfect location for excursions to Lihue for a helicopter tour, Port Allen for a boat tour of the Na Pali Coast or a day at Poipu Beach, voted sixth best of all the beaches in the Hawaiian Islands by the Travel Channel. It was wonderful lying on the beach and watching the humpback whales just a mile or two offshore. The grounds were well groomed and beautifully landscaped to showcase Poipu's tropical location. The staff were all great. Diane in the office helped us reserve our villa and was exceptionally helpful making dinner reservations and other arrangements for us during our stay. Herb Lee, the owner, helped us in ways that no major resort owner would have considered and we're grateful for his advice as well. There's no question in our minds that we'll return to Kauai for another visit, it's just a matter of deciding when's the best time to go, and when we do we wouldn't consider staying anywhere but Hideaway Cove. Our first visit was our honeymoon vacation but any return trip to Kauai will be special to us because of Herb and Diane and all the others who made the critical difference for us. I prefer to stay in rental homes or condos when vacationing and Hideaway Cove felt like it was your own home in paradise. Well furnished and a great location a block from Poipu Beach. access to the beaches, gas BBQ , laundry facilities, and comfortable living space made for a wonderful time. Having backpack beach chairs to take to the beach, which also carried your beach items, was great. Poipu beach was an easy short walk and was great for snorkeling, swimming and relaxing. My children loved the waves at Brenneckes Beach( beside Poipu Beach). I've been meaning to write a review on Hideaway Cove for a long time...my husband and I stayed in the Aloha Suite last November. So awesome. As soon as we arrived, we were greeted with an absolutely spacious 2 bedroom/2 bath condo--plus a note from the staff and a fridge ready with juice and other helpful necessities. It was little details like that that made it feel more homey, though just as nice, as one of the nearby hotels. 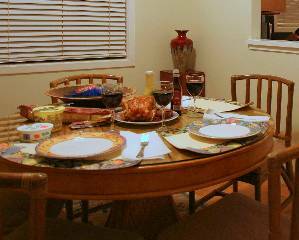 We like to both eat out and cook in, so having access to a full kitchen and a great gas grill on the deck was ideal. After a day of activities, coming in and having access to a washer and dryer was also a big plus. A big thank you to Diane and the Hideaway Cove staff. We'll be back!! My husband and I wrapped up our Hawaiian honeymoon in Kauai, and accidentally stumbled across this wonderful little inn in our search for a bed and breakfast. Not a "B&B", it is a lovely, homey inn comprised of two houses-- where couples and families are separated so can each have thier own comfy spaces. The ammenities in the room are perfect (complete kitchen, huge bathroom and SOFT beds)...we certainly got more than we were expecting, and Herb and Gail were just as friendly and accomodating as they could be!!! If you would like to relax and unwind in a great place to stay, then the Hideaway Cove Villas in Poipu is the place for you. No expense was spared in making sure their guests have a first class tropical getaway. The lush grounds are well groomed and beautifully landscaped. I loved listening to the doves cooing in the backyard while I enjoyed the rain shower, and the luxurious bathroom in the morning. The setting for the villas is ideal as they are located in a lovely, quiet, peaceful neighborhood with only a short walk to the white sands of Poipu Beach and great restaurants. The air conditioned villas are modern and immaculate with great attention to every beautiful detail. 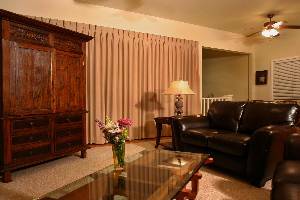 The amenities are top of the line, and the feeling is extremely welcoming and homey. As a guest you feel your every comfort was given great consideration and care. Having beach chairs, towels, a cooler, and juice in the refrigerator waiting for your arrival are just a few of the nice personal touches. Gale and Herb are as kind, friendly ,helpful and accommodating as can be. What adds to the ultimate in personal service is their office on site, where Gale, who has 20 years in the activity business on Kauai, is available to assist you with your activity planning. Hideaway Cove Villas is a perfect spot in paradise, and we are really looking forward to our second visit there this winter. Great location, wonderful accommodations, definitely would go back. Private, but still close to a lot of great adventures or relaxing walks and the beach. Best of all worlds. We found the Hideaway on tripadvisor and highly recommend the villas. We had a wonderful time. Lots of extras...cooler, beach chairs and towels; kitchen had all the necessities; very clean and nicely decorated. Great location! Home away from home . . . will return annually! Kauai is my favorite island in Hawaii and I wanted to stay where it was peaceful, a bit "tucked away," right by the ocean, and where I have all the amenities of home. The villa was very welcoming from the start -- they have fresh juice made just for you waiting in the fridge and a very warm welcome letter. Everything is very clean, orderly, and every corner has a special touch to make your stay extra comfortable, i.e. i-pod dock, all necessary kitchen utensils, sateen sheets. . . It is beautifully nestled in a quiet neighborhood and you feel right at home. There is no busy hustle of tourists and traffic. Just you, the ocean, and beautiful trees and orchids. The staff is very genuine and always eager to make your stay absolutely wonderful. We like to stay at a place with a small number of units, not a mega-hotel. We were in the dolphin suite on the ground floor, but still very quite, lots of room. Bathroom- great lighting, wonderful shower-took a little while for the hot water. 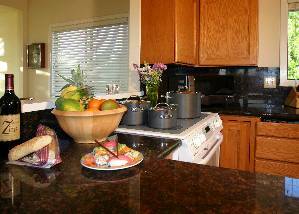 Kitchen and amenities were more than adequate. Outdoor grill worked great. Super comfortable bed. Lots of screen area so the air movement was great. Did not use the A/C. Nice yard in front to sit and read in the sun. The Lani is secluded by shrubs which gives privacy. Short walk to the beach. It was a little hard to find as we came in the dark. Having looked at google earth really helped. There are not a lot of signs on the Island so at first it is easy to get lost, but then your really can't go too far since it is "an island". Diane was great help and the business center was more than adequate and the Wifi worked well. Overall this is just a wonderful room with a solid high quality feel that is off the beaten trail, but not too far. I booked the seabreeze for my honeymoon and it was great. The hottub was sweet. When we arrived they had a bottle of champagne waiting for us and nice card congratulating us on our wedding. The amenities were very nice and the bed was very comfy. There seemed to be a lack of hotwater in the shower but it didnt bother us too much. Sometimes it was very hot and others it was luke warm, but not a big deal. There is a nice restaurant next door Casa di Amici which was pleasant, maybe a little pricey but most all restaurants are on the island. Although not located directly across from the beach, it was an easy stroll down to the beach. We went boogie boarding and had lots of fun. We also recommend scheduling a massage at the nearby marriot, which you can walk to along the beach. there are shopping centers/restaurants nearby so that was easy. There is construction going on near this area but it never bothered us at all, it was far enough away not to be an issue. We stayed at this place(during the second week) and another house on the north shore (the first week) and thought this was nicer and the hot tub was great for a romantic getaway. It was a great way to end the honeymoon. If your going on your honeymoon, I highly recommend this place and the seabreeze room. 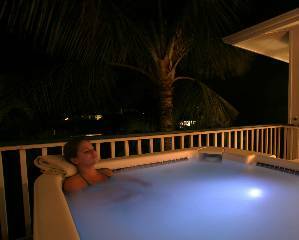 You dont have to worry about kids running around, its extremely private and the hot tub is to die for. Wow! Great place to stay!!!! With Hurricane Ike heading towards the Carribean, we decided to change our honeymoon destination last minute. Tripadvisor.com made it easy for us to select and research Hideaway Cove. We read reviews written by others and decided that Kauai was the perfect place for our honeymoon. We wanted to choose an island that wasn't too commercialized, and many of our friends recommended Kauai. Kauai also had a ton of things to offer, sightseeing, snorkeling, zip-lining, helicopter rides, and yet you could also just relax and do nothing and take the beauty of the island in. We thought Poipu Beach sounded great. We then looked at reviews and photos of Hideaway Cove, and that helped us make our decision easy. We stayed 7 nights at the villa named "Coral". it was a one bedroom villa. air-conditioned bedroom, full kitchen, living room, private bathroom. it also had an on-premise facility with washers/dryers. Herb and Gail were very prompt with emailing us directions and other helpful things to find in the Poipu Beach area. Our villa was very well kept. On arrival, our full size fridge had a little treat waiting for us - some of the island's fresh guava juice, a very nice touch. We loved it there, we would definitely stay there again!!! Don't miss our videos on YouTube by entering "hideaway cove vacation" in their search box. Deposit: One half due at time of reservation, balance due 60 days prior to arrival. Cancellations and Refunds: Full refund, less $100 unless cancelled with less than 60 days notice. In that case, full refund if unit can be re-rented. Other Fees: Out cleaning fee varies depending on the Villa. See website for exact amounts. Required Stay: Two night minimum stay.